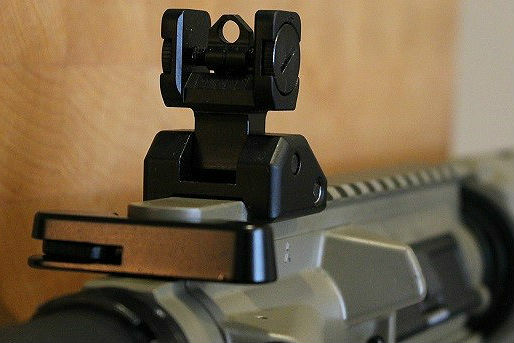 Though many shooters these days use some sort of optic on their AR-15 as their primary sight, having a good set of backup iron sights is still a really good idea. However, though they are similar in many ways, the backup iron sights on an AR-15 are slightly different from iron sights on many other rifles. 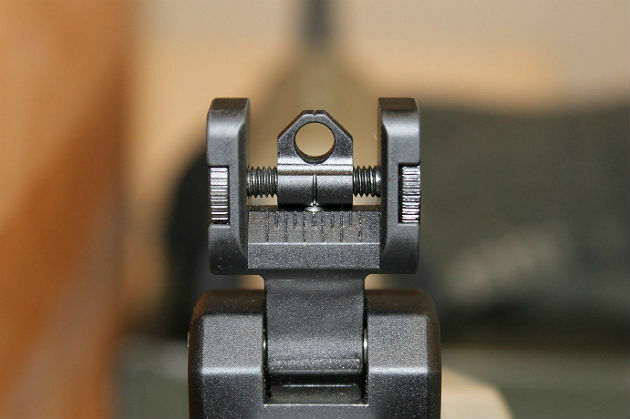 Here is a step-by-step guide on how to zero the backup iron sights on an AR-15. Many of the "flat top" AR-15s on the market today come ready to accept a backup iron sight (BUIS) to use in case something happens to the optics on the rifle. While they come in a wide variety of configurations, the basics of how to use them remain pretty much the same. First, ensure that your backup iron sights are properly installed and mounted securely to the rifle. If you are able to wiggle the sights with your hand, they are not secured properly. Second, mechanically zero your backup iron sights. For the rear sight, ensure that the aperture is exactly centered in the housing. To do this, adjust the aperture until it is all the way to one side. Then, count how many clicks it takes to adjust the aperture until it is all the way on the opposite side. Divide this number by two, then move the aperture back that number of clicks. Assuming that you have a standard front sight, adjust the base of the front-sight post until it is level with the sight housing in order to mechanically zero it. To do this, depress the detent on the front side of the post and turn the post at the same time. You can use the tip of a bullet, a multitool, a nail or a specially designed front-sight adjustment tool to accomplish this. After mechanically zeroing the backup iron sights, you're ready to start shooting. I like to shoot at 25 yards, then move out to longer ranges after I adjust my sights. This saves time, ammunition and frustration in the long run by ensuring that my shots are at least on the paper. Don't worry too much about the type of target you use. Almost any target will work, as long as it has a distinct aiming point. Just like when zeroing any rifle, it is important that you shoot using a stable, supported position when zeroing your backup iron sights. Try to avoid supporting the rifle with your muscles and use a stable object like a sandbag instead. From a steady shooting position, fire three shots at the center of your target at 25 yards (or whatever range you are shooting at). After firing your first group, check the target. Measure from the center of the group to your aiming point, and adjust your sights accordingly. 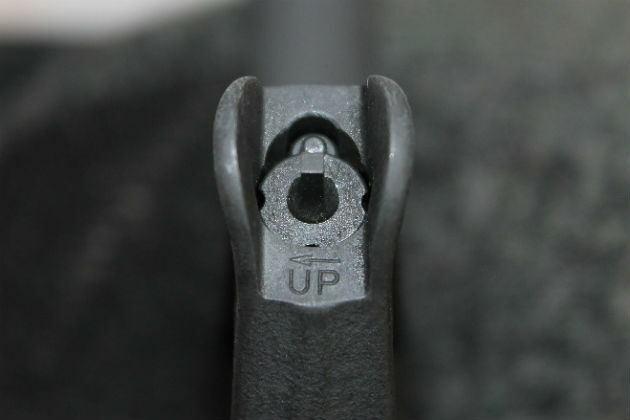 For most sets of backup iron sights, you must adjust the front sight to move the impact of the bullet up or down and adjust the rear sight to move the bullet impact left or right. As you can see in the photo above, turning the front-sight post clockwise will raise the point of impact of the bullet. On this same rifle, turning the rear-sight adjustment knob clockwise moves the bullet point of impact to the right. However, different AR-15 variants will often have different MOA adjustment values. On some rifles, one click on the front sight will move the bullet impact 1.2 MOA (about 1.2 inches at 100 yards), while others will move the bullet impact 1.5-2 MOA. The same goes for the rear sight, and you can expect one click to move the bullet impact .5-.75 MOA, depending on the rifle. The only way to be 100 percent sure with your rifle is to take it to the range and experiment with it. Also, don't forget that when shooting at 25 yards, you will need four times the number of clicks (4 MOA equals about 1 inch) to move the bullet impact the same distance at 25 yards as you would at 100 yards. For example, assume that I shot a group at 25 yards that hit 1 inch high and 2 inches to the left with a rifle that has 1.25 MOA elevation and .5 MOA windadge adjustments. Since I need to move the bullet impact down and to the right, I'd rotate the front sight three clicks counterclockwise (round to the nearest whole number) and adjust the rear sight 16 clicks clockwise. After making the required number of adjustments, shoot another group. If that group hits where you're aiming, your AR-15 is now zeroed at 25 yards. If not, make the necessary adjustments to your sights and continue shooting until you have a good 25-yard zero. Using the same techniques described earlier, you can now start shooting at longer range, if desired. Since you zeroed the rifle at 25 yards, it should be at least hitting the paper at 50 or 100 yards. The only difference now is that you need to remember that the number of clicks necessary to move your bullet impact at 50 or 100 yards is different than at 25 yards. At 50 yards, moving your sight 2 MOA/inch and at 100 yards 1 MOA/inch. There is a lot of debate in the shooting community about the best distance at which to zero your AR-15. The correct answer all depends on the specifics of your rifle and ammunition as well as the typical distances at which you plan to shoot your rifle. For most people, a 50- or 100-yard zero for their back up iron sights will work great. Regardless of what range you choose for your final zero range, after you've made your final adjustments, fire one last group to confirm your zero. If your group hits where you were aiming, you're done. While you hope to never have to use it, a good backup iron sight will hold a zero for a long time.